Tavneet Suri is an Associate Professor of Applied Economics at the MIT Sloan School of Management. She is an NBER Faculty Research Fellow, a Junior Affiliate at the Bureau for Research and Economic Analysis of Development (BREAD), a Research Affiliate at J-PAL, a Research Affiliate at the Center for Economic Policy Research (CEPR) and the Co-Director of the Agriculture Research Programme at the International Growth Center (IGC). Tavneet’s research centers on applied microeconomic issues in sub-Saharan Africa. In particular, she works on technology adoption (agricultural, water, cell phone), risk sharing and consumption smoothing, the role of measurement error in poverty dynamics, and the role of infrastructure in the development of markets. Her research currently spans Kenya, Ghana, Rwanda and Sierra Leone. 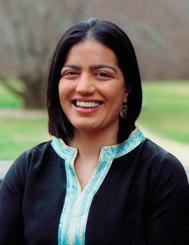 Tavneet completed her PhD in Economics at Yale University and is Co-Chair of J-PAL's Agriculture sector.